Some ex-Legends could find themselves testing what could be one of the most significant changes to the game for years. After a trial in the men's county championship last season, "rolling substitutions" will be introduced into BUCS inter-university rugby this season - both men's and women's. This is a very controversial development - some people seeing the idea as being a major contribution to player welfare, while others say it will change the game forever. Rolling players on and off is not uncommon in junior rugby - especially friendly games - but whereas that is normally just a means of making sure everyone gets a game, rolling subs at a higher level becomes a coaching tactic. The basic idea is that - if a player is substituted - they will no longer out of the game - they will be able to go back on again. Trouble is that, as well as being used to rest players, this might mean that key players could be brought on for key set-pieces - penalties, line-outs, scrums etc. - and then taken off again. To try to counter this teams are not being complete freedom to "roll" players on and off whenever they wish - instead they will be limited to 12 "interchanges" in a game. In practice, where this has been tried (and it is used in Rugby League, apparently), it has been the front row that has benefited - props in particular being rolled on and off to keep them fresh and fit. Whether the rule change will be extended to the wider game, or whether there will be a wider trial, will be decided after the end of the university and county seasons in April. A bit specialised and technical this, but if anyone is including rugby as an option in their GCSE or A-level studies (or even beyond) it could be worth looking at. The system brings together all of the main IRB regulations on equipment, performance assisting drugs, injury prevention and reporting, and other welfare matters. If you want to run a tournament, for example, all of the main rules and advice are here in one place. By and large there is nothing new here, but its well laid out and does bring lots of different things together in one place, making everything much easier to find. Especially if you have some sort of assignment to write. Go to http://www.irbplayerwelfare.com/ to find out more. Herts 7s saved - and girls' season extended into May. Great news today. Thanks to the hard work of Peter McCullough and others at county, the RFUW have given the go ahead for Herts Sevens to be played after the "official" end of the season at the end of April. The seventh edition of what has now become the biggest girls sevens tournament in the UK - and possibly anywhere else - will now take place on Sunday 6th May, probably at Hertford. What is more it will now be "officially" endorsed by the RFUW, and will be played a week before the National Sevens - which will also now be in May (14th May, venue to be confirmed), which makes much more sense than the mad idea of holding the event over Easter, as was previously intended. With Herts Sevens now being played as an "official" event, over a Bank Holiday weekend, at the end of the season, and just a week before the Nationals, interest in the competition promises to be enormous! Don't miss it!! Good news for ex-Legends and other distant followers of the team. After loads of hard work from existing players, managers, and the wider club - encouraged by Amanda Bate - Sydney tells me that the girls section now has not only a permanent coach but, even more importantly, a solid core of around 20 players, mainly at U15 level. It is a rate of growth that matches - even possibly exceeds - that of 2004, and being mainly at U15s gives the team a great base to build on for the next four years or more. The U15s play their first game, at home, on Sunday - kick-off at c1pm. If you are around, why not come along and watch (and cheer on) the "new" Letchworth Girls? Congratulations to Jade Cooper, currently guesting for Saracens, who scored in what sounds like an overwhelming victory over Luton in their opening U18 league fixture. As results go it was not unexpected - Saracens are, as we know, an experienced side while this would be Luton's first season. However, the size of the win does again question the idea of trying to get all teams - large and small, experienced and complete beginners - into the same, competitive, structure. Teams have to begin somewhere, obviously, and it is good to challenge a team against higher ranked opposition. However in the past - when the core of a season would be based around friendly fixtures - opposition could be selected and allowances made, especially if it was clear that games were one sided. But in a league you have no choice who you play and, with points and position at stake, not much room to manoeuvre over playing conditions either. Occasionally I get to see rugby in schools and - as rule - most players seem to be able to pass and run, but tackling, rucking, mauling and, above all, scrummaging is normally pretty awful. This has always seemed a bit odd as all of these largely forward skills are dead easy to teach, great fun, and require little natural skill, ie. to perform at least adequately you do not need to be, say, a naturally fast runner, or even particularly strong - you just need reasonable technique and an ability to be in the right place at the right time. Over time I had put these deficiencies down to the inescapable problem that the classes I get for rugby are invariably composed of boys, with all the obvious limitations that implies. However, today I happened across some Level Descriptions for rugby and I think I may have been wrong. These descriptions will vary slightly from school to school, so if you are doing PE for GCSE or beyond you might want to check out yours, but what is stunningly obvious was that - whoever produced the basis behind these descriptions - you can bet your life he (definitely a "he" I think) was a back. Take a typical Level 4 description. This will probably include lots of stuff about "passing accurately" and "using footwork to beat a defender" - all very important back skills - but of the important stuff for forwards you probably will be limited to a passing "be able to ruck and maul in a practice situation". Level 5 probably won't be much better - lots of things about spin passes that would allow a back to impress, very little about rucking or scrummaging that would give a forward a chance to score points. Frankly looking at the descriptions I saw today I can think of a few U18 regional level forwards who would struggle to reach a Level 5, while the average club-level backs would sail to a Level 8 with no problems. In short, if you ever wonder why your school rugby consists of endless, endless passing drills, or why rucks are a mess, why nothing gets beyond second phase, and why no-one can scrummage properly, this would seem to be the answer. And if you are a forward (especially a front row!) getting lower scores than you expect - you now know why. England and Wales will have a new partner in U20 rugby this spring with news from north of the border that Scotland are setting up an age group squad, and will be playing both of the other home nations. Whether these games will be tallied together to make an official "Tri-Nations", or whether we will just have do it unofficially, has yet to be revealed. England and Wales have been playing age group internationals against each other since 2003 - and, unlike the senior side - this has not been one-way traffic. Wales beat England at U19 level in 2004 and 2005 (when they also drew the return), and also won earlier this year at the new U20 age band. England, on the other hand, won three U19 games between 2003 and 2007 and have since added three wins at U20s. That Wales seniors have so far failed to build on their junior success (apart from that one game in 2009) is one of the slight puzzles of international rugby - is it a superior coaching regime in England, or a failure of the Welsh to bring their juniors through? Now Scotland join the party - and it will be very interesting to see how they get on. We have all seen how the Welsh reforms of their junior structure resulted in significant improvements at regional level, so the success of their U20 team has really been no great surprise - but the Scots are an unknown quantity as there is not nearly as much cross-border rugby north:south as there has been east:west. These games will be fascinating to watch (though you suspect that Anglo-Welsh experience may give them an advantage at the start). Its an exciting prospect. Perhaps the next step would be to get the French to join in on a regular basis, and maybe the Irish too. A European U20 championship perhaps? And, of course, its something that all junior players can aspire to take part in. The new divisional structure will - at U18s - feed into the U20 squad trials, which is why country rugby is so important. A hart on the shirt this winter could be the first step to a red rose next! (Or, alternatively, if anyone has family ties that give them the right to march behind the Saltire, there is still time to register for the Scotland trials). 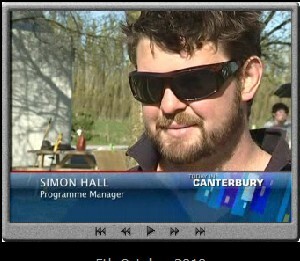 Former Letchworth Girls coach Simon Hill was caught on New Zealand TV yesterday. Despite attempts to hide behind a name change and some seriously heavy dark glasses, the former Letchworth 1st XV prop - who guided the girls through one of the most successful seasons (expanding vocabularies on the way) - is clearly recognisable as he makes waves (well, gardens anyway) in the Belfast area of Canterbury. Amanda Bate is working to help get Letchworth Girls back to where it used to be (and belongs!) and has come up with a great idea to create publicity, raise funds, and generally show off to all and sundry what a great game this is. Yes, anyone who has ever pulled on the black and amber of the First Garden City is invited to squeeze into those old shirts again and take on the former players of the Second Garden City. It is proposed that the game take place under the new Letchworth floodlights (they have finally replaced that 40w bulb!) on 20th December, with food and drink a-plenty afterwards (plus before, and maybe even during, if needed!). Invites via Facebook have been sent to those whose Facebook details are known - please reply if you have had one. If you haven't then please let me know if you are interested asap - and tell anyone else you know as well!